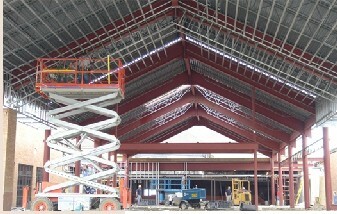 This project is comprised of a new large covered entrance drop-off, a gracious exposed structure central Lobby which leads to the Worship Center seating 1200, new Administration Suite and a Youth wing with full Gym and Classrooms. 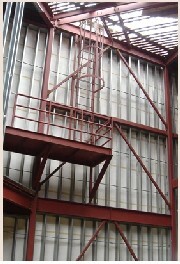 The worship center is built with a steel frame, bar joists and and metal stud walls. It has a sloped concrete floor in the body of the church and stepped seating with pre-cast floors supported by masonry walls at the rear. A full stage with fly loft and rear projection screen lofts comprise the front of the space. 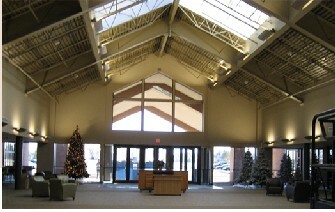 The structure was also designed to accommodate future expansion. Other features in the project include a generous Sub-lobby and connecting glass Hallway Link, a vaulted Prayer Chapel and an Administration suite all constructed of steel studs, steel frame and bar joists.